Melissa Pressler is a senior at Riverhead High School. Throughout the past four years of high school, Melissa has paid particular attention in her art classes and has had an avid interest in art in its many forms. We are proud to congratulate her on choosing to accept a scholarship to attend the School Of Visual Arts in New York City, next year. Art is a word used to define many different channels but Melissa’s focus is illustration, one of the most popular styles of the visual arts. Recently, Melissa’s artwork was featured in the Parrish Art Museum Student Exhibition. Illustration challenges the artist to create a visual representation in order to provide emphasis on a particular subject. For Melissa, the subject of her piece was the “Om” symbol. 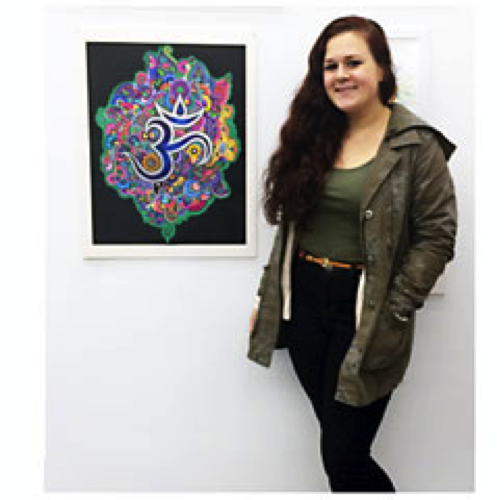 She submitted a creation titled “Om,” which was a creative ink illustration of the mantra that is considered sacred in various religions such as Hinduism, Buddhism and Jainism. The “Om” symbol represents four states of human awareness. The first state is ordinary, as in a walking or material state. The next state of human awareness is deep sleep, followed by the dream state and finally the absolute conscience state of being. We commend Melissa for her artistic vision and success, and wish her well at the School of Visual Arts. Beautiful work Melissa, nicely done!